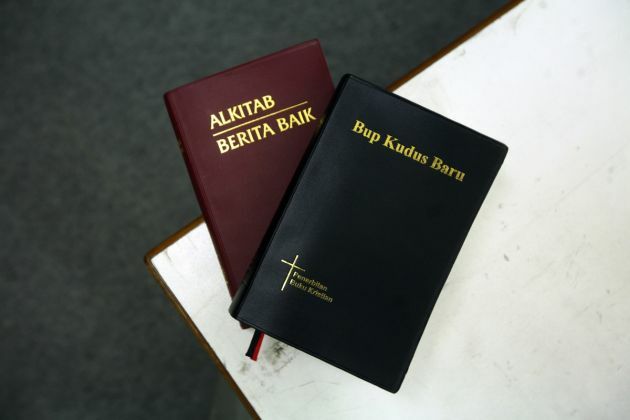 (Photo: REUTERS / Samsul Said)Two copies of the Bible in Malay (L) and the Iban dialect are seen in this picture illustration taken in Kuala Lumpur January 2, 2014. Islamic authorities in Malaysia on Thursday seized 321 Bibles from a Christian group because they used the word "Allah" to refer to God, signalling growing intolerance that may inflame ethnic and religious tension in the Southeast Asian country. The raid comes after a Malaysian court in October ruled that the Arabic word was exclusive to Muslims, most of whom are ethnic Malays, the largest ethnic group in the country. The words on the books read, "Good News Bible" (L) and "New Holy Book." The row over the use of the word 'Allah' by Christians in Malaysia has erupted again with members of the ruling UMNO party saying a Catholic priest's insistence on the right to use the word is "treasonous." Catholic weekly Herald newspaper editor Rev. Lawrence Andrew, in an article posted by a news portal, said that Catholic churches in Selangor would continue to use the word Allah in their weekend services in Bahasa Malaysia, the Malay Mail online.com reported Thursday. State leaders of the United Malays National Organisation (UMNO) said Father Lawrence had committed treason against the Selangor Sultan by insisting on using the word "Allah." An ongoing legal dispute between the Malaysian government and the Catholic Church over its right to print the word "Allah" in the Herald's Bahasa Malaysia section is pending before Malaysia's Federal Court. The court is set to hear arguments from both sides on February 24 before deciding on whether it will hear an appeal by the Catholic Church. Former Malaysian prime minister Mahathir Mohamad has now entered the fray, the Bernama news agency reported on January 1. Mahathir, who led the country from 1981 to 2003, said the belief or faith of the Christians in the Malaysian peninsula will not be affected even if they do not use the word "Allah" to refer to their God. The former prime minister said the Arabic term for God was only a common usage among Christians in the Sabah and Sarawak areas. "All this while we have never quarrelled about this because they (Christians in the peninsula) never use the word, so why irritate other people, it won't hurt them not to use the word 'Allah'." One group of UMNO veterans asked Lawrence convert to Islam if he insists on using "Allah", as they said this would allow him to comply with the Selangor state ban on the non-Muslim use of the Arabic word. An October 14 ruling by the Court of Appeal of Malaysia upheld that the Roman Catholic weekly Herald newspaper must refrain from using the word "Allah" in its publication and that a ministerial decree did not infringe on the newspaper's constitutional rights. The court found that use of the name "Allah" is not integral to the faith and practice of Christianity and that such usage would cause confusion. The United Nations Special Rapporteur on freedom of religion or belief, Heiner Bielefeldt, however, urged Malaysia's government on November 25 to reverse its decision to ban the Catholic publication from using the word "Allah" to refer to God. Bielefeldt warned that the case may have far-reaching implications for religious minorities in the country. "Freedom of religion or belief is a right of human beings, not a right of the State," Bielefeldt stressed in a statement. Earlier the Lutheran World Federation had expressed deep concern over a Court of Appeal ruling in Malaysia, forbidding the Herald from using the Malay-language word "Allah" for God. In a November 5 letter to LWF church leaders in Malaysia, the president of the Lutheran federation, Bishop Munib A. Younan, and its general secretary, Rev. Martin Junge, called the ruling an attempt to suppress freedom of religion and expression in Malaysia. The Lutheran leaders also said the decision could lead to confusion, resentment and discord. "This ruling ... goes against the centuries-old, well-accepted use of the word 'Allah' by Arab Christians in the Middle East and other parts of the world," they said. In January, 2013 Christians in Malaysia had said they would not observe the ban on using the word "Allah", imposed by a decree of the Sultan of Selangor state. The churches in Malaysia said they were united with a common purpose. A January 10, 2013 statement sent to Fides Agency, the Christian Federation of Malaysia reiterated its "constitutional right" to call its God with the term "Allah". It pointed out that the word has been present in the Malay language bibles for over 400 years. The Christian Federation, established in 1985, is an ecumenical organization that brings together the main Protestant and Orthodox Churches and the Conference of Catholic Bishops. Muslims comprise around 60 percent of Malaysia's 28 million people. Christians make up around 9 percent of the population in a country that also includes Buddhists and Hindus among other religious groups. As religious tensions from the five-year-old "Allah" controversy spilled over into 2014, senior Christian clergymen appealed for mutual respect from Malaysian Muslims. They said they too have the right to practice their faith according to the dictums of their own religion asking that the constitutional rights of Christians be recognized. They urged an end to hate-mongering fueled by the tussle over the word "Allah" which has divided Malaysians along geographical and racial lines. "We are not expecting Malaysia to be a Christian country. The main thing is respect. "Respect and recognise that each individual has the right to choose whatever they believe," Rev. Datuk Jerry Dusing, president of the evangelical Sabah Sidang Injil Borneo (SIB). "That's the central tenet of human rights," he told the Malay Mail online. UMNO is the longest ruling party in the world having ruled Malaysia, sometimes in coalition, since 1951. In recent years it has lost ground, in some instances to parties with an Islamist agenda. Some commentators have said its latest actions are pandering to voters inclined to Islamist parties.